June 20, 2017 / Modified jun 23, 2017 11:05 a.m.
Frankie Burgos, staff member of the Warrior-Scholar Project, teaches a class. Rachel Wakefield, a 20-year-old, active-duty Marine, will be discharged from the military this summer, just in time to enroll as a freshman at the University of Arizona. The prospect of college has her nervous. Wakefield said she wanted to go to university straight out of high school, but couldn’t afford it. Now she can, thanks to the G.I. Bill benefits she will receive upon finishing her military service. Wakefield will be on a full scholarship for wheelchair basketball. She said college life makes her somewhat uneasy because it is the polar opposite of military life. Wakefield is on campus this week to mitigate some of her insecurities. She’s participating in a two-week college-preparation crash course called the Warrior-Scholar Project. In its second year, the program is aimed at helping veterans who have been out of the academic realm for years get back into the swing of school and civilian life. Warrior-Scholar Project curriculum manager Amy Page said the program started at Yale University in 2012 and gradually expanded to other universities. 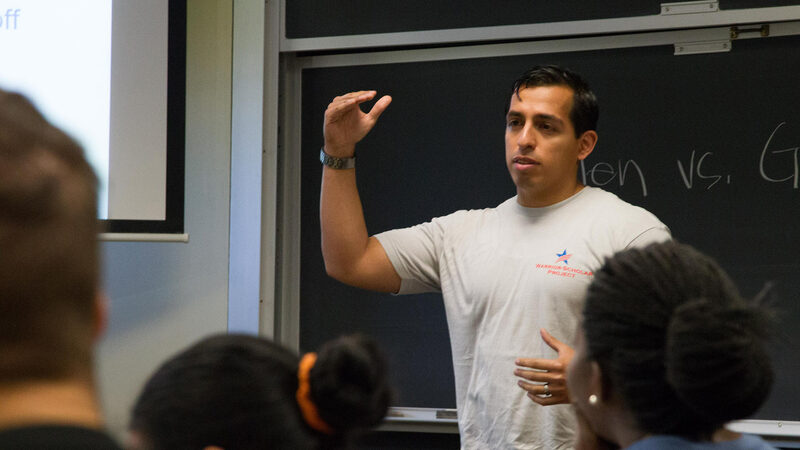 Project staff member and Marine Corps veteran Frankie Burgos attended the program at the University of North Carolina, Chapel Hill, in 2016. He said the project eased many of his college-related fears. Another program participant, Marine Corps veteran Ruben Cruz, said learning to overcome the insecurity of failing at school is stressful. And having no higher-up telling him what to do next hasn’t mitigated that fear. Cruz said that in a way, though, the veterans stress about the same things any person about to start college would. They don’t want to fail or disappoint themselves or others. They fear becoming overwhelmed. “Trying to do everything by yourself — it gets tough,” he said. Insecurities aside, the veterans are excited about starting college. They’re motivated and ready to take on a new challenge. And that is the fulfilment of the program’s founding philosophy – to help veterans better acclimate to post-military life. Learn more about the Warrior-Scholar Project on Arizona Illustrated. The Warrior-Scholar Project partners with universities across the U.S. to help veterans take on the transition from the battlefield to the classroom. To apply or find out more, visit http://warrior-scholar.org.